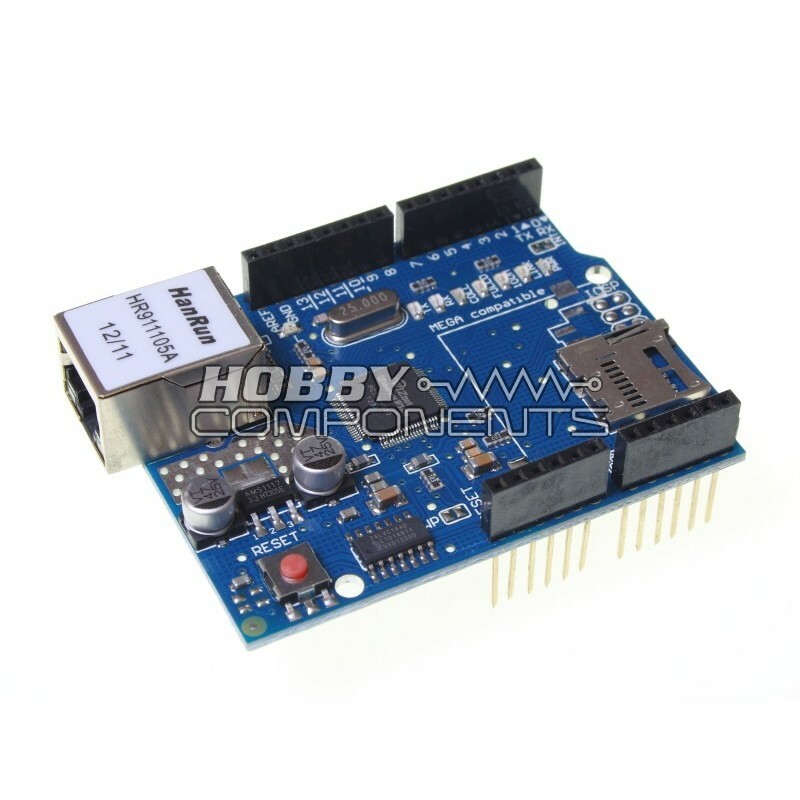 This Ethernet Shield is based on the Wiznet W5100 Ethernet Chip and gives you an easy way to get your Arduino online. It is directly supported by the official Arduino Ethernet Library. It also includes an additional micro-SD card slot, which can be used to store files for serving over the network. It is compatible with the Arduino Duemilanove (168 or 328), Uno as well as Mega (1280/2560) and can be accessed using the SD and Ethernet libraries. Ethernet libraries. It requires no additional libraries to work. contains the contents of a text file saved on an inserted micro SD card. attempt to read the contents of the test.txt file and serve it to the client. The main chip (Wiznet W5100) on my shield has solder bridges on some of the pins, is it faulty? This is quite normal and is just where two or more adjacent pins (normally unused or ground pins) share the same pad area which effectively shorts these pins together. As a result the solder naturally flows between these pins making it appear that the short is not intentional. You can reference the image below of a working shield to confirm your board is ok.
Can you verify that no modifications need to be made on the Mega 2560 when connected to the above shield. With the Ethernet shield connected to my Macbook using the Arduino Files/ Examples/Ethernet DHCPAddressPrinter sketch I get "failed to configure Ethernet using DHCP". I see the leds flashing on the shield when connected. Yes, this shield will work with one of our Megas without requiring modification. Have you tried our above Analogue Input Example? This is a known working program and will help eliminate any software issues. This shield work on Arduino MEGA 2560 R3, but Analogue Exemple works only with Uno card. http://arduino.cc/en/Reference/SPI wrote: SPI library supports only master mode, this pin should be set always as OUTPUT otherwise the SPI interface could be put automatically into slave mode by hardware, rendering the library inoperative. Thanks for this information although I have to say it has had me scratching my head this morning. Just to confirm, we have tested the above code on both our 2011 and R3 Mega’s on numerous occasions and we have not seen any case where the shield failed to work. However I’ve had a look at the Atmel datasheet and it confirms that if this pin is configured as an input and somehow was to be pulled low (? ), it would be interpreted as another master on the bus attempting to communicate. This would cause the hardware to switch theSPI mode form a master to a slave. When this pin is configured as an output it has no effect on the SPI system. So in summary there is a condition where by not configuring this pin as an output on a Mega could cause the shield to suddenly stop working. But the confusing thing is that there is nothing directly connected to pin 53 that could potentially drive the pin low (other than external noise). I’ve updated the code to include this line as I agree that it should be set to an output to stop any potential issues like this. Is there anything special about your setup that could cause pin 53 to be driven low? Did you purchase your shield and Mega from us (i.e. are they the same make) ? I have got the shield working on the Uno and a Mega 2560 clone so I am very happy. Used a different code example but my initial problem was incorrect IP. I did not have to do any configuration with the exception of the IP address. When I get a chance I will test your code. I tried the first sketch provided here and several of the examples provided in the standard Arduino 1.05 ethernet library. Where error checking is present - ie the library examples - I get "WiFi Shield not present" on the serial monitor. That you have tried the Analogue Input Example? By not working, do you mean you are not getting a webpage in a browser? How are you powering the uno and shield? Have you have changed the IP address within the sketch to match your networks subnet and that it is not in use by any other device on your network? Do you see any LED's illuminate/Flash on the shield and could you describe them? The error message is a bit weird but for the purpose of debugging the problem it is best to stick to out Analogue Input Example as this is a known working program. By not working, do you mean you are not getting a webpage in a browser? that is correct; I can't even connect to the relevant IP address with either Chrome or IE. .
Have you have changed the IP address within the sketch to match your networks subnet and that it is not in use by any other device on your network? I can confirm that the IP address within the sketch matches my network and is not already in use.